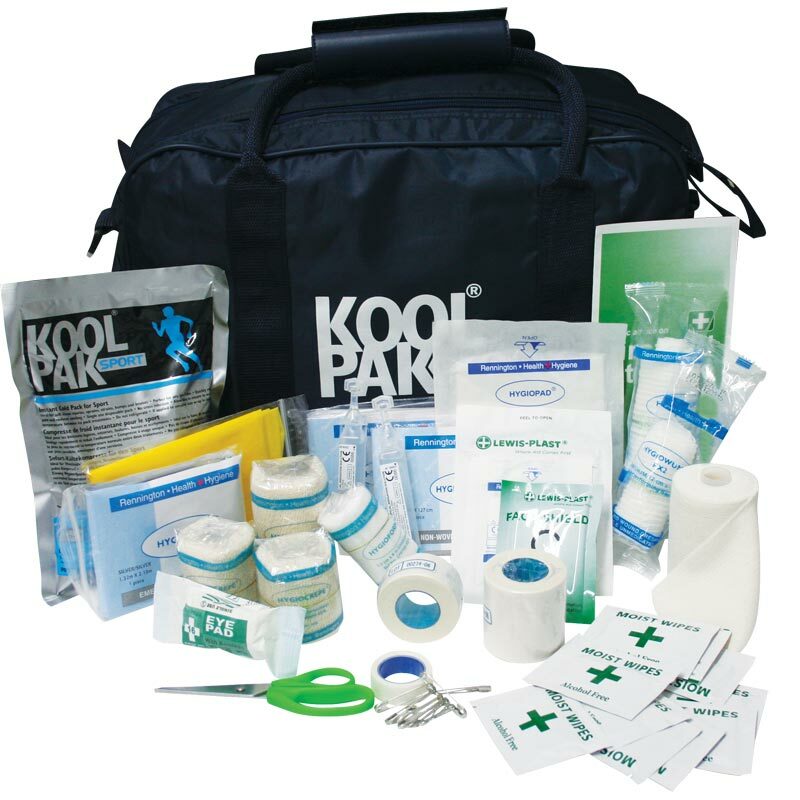 The Koolpak ® Sports First Aid Team Kit is perfect for match days when those injuries may occur. Be prepared for every eventuality. Prepared in discussion with football, rugby, hockey and cricket teams, but also works well as a general sports first aid application kit. Contains all the items needed to treat minor injury on the playing field. Supplied in a water resistant run on bag. Bag size - 39 x 28 x 19cm. 1 x Conforming bandage 7.5cm x 4m. 2 x Crepe bandage 7.5cm x 4.5m . 1 x Microporous dressing tape 1.25cm x 5m. 1 x Sport instant ice pack. 1 x Sterile dressing Large. 1 x Sterile eye pad. 1 x Zinc Oxide tape 5 x 5m. I regularly buy these for our new under 7 football teams each season, really good value bag has room to pop a few bibs in as well. A quality first aid kit, comes with a handy strapped bag. We used it for our outdoor youth residential and will store for weekly sports sessions. 4 out of 5 Good entry level or back up. Purchased for assistant coaches, so we allways have kit at training/matches if main kit is not available. Does the job just fine, and we'll within budget. A very good first aid kit for junior football team. Well stocked with everything you need easy to carry for a fast response. 5 out of 5 Great quality! Don't bother with cheaper products, it's false economy. Great quality bag that will last for years and the products are better than most competitors and easy to replace. Really impressed for the money. I have used Newitts on several occassions for various items. This time First Aid kits were needed yet again I am delighted The ease of the site is excellent. Completeing the order so easy. Kept up to date with delivery date. Arrived in well packaged presentation. I was extremely impressed with the goods. As always recommend goving Newitts a try. 2 out of 5 Fragile! Bag received on tile and in apparently good order. Would suggest that the materials are not particularly substantial and on its first outing the top zips broke rendering it useless as a protection for the medical supplies it holds. However, Newitts were very quick to offer a replacement bag and the undertaking that if the same happened again, they would refund the cost in order for me to purchase an alternative. Top class customer service - not sure about the fragile bag yet! Absolutely everything you need for a Sports first aid kit, extremely cost effective and I would highly recommend. We have a few of these and they are a necessity for all sports, don't be left without one! Excellent first aid kit for any sports team in an easy to car bag..would definitely recommend.Free delivery a bonus and arrived promptly! A very good product. plenty of seperated areas for the different items included in the kit and any additional items added to the kit.